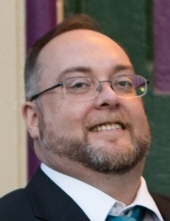 Stephen A. Caldwell, 42 of Batavia, passed away on April 4, 2019. Born September 28, 1976, in Kettering, OH, to Reed and Letisha Caldwell. Beloved husband of Melissa Caldwell (nee Mays); loving father of Meghan Thomas, Joscelyn Caldwell, and Alliandre “Alli” Caldwell; brother of Clint Caldwell; and grandson of Phyllis Murray (the late Odis). Stephen was also survived by numerous aunts, uncles, cousins, and friends. Preceded in death by his daughter Victoria Thomas Fonticiella; grandparents, Farmer and Wanda Caldwell and Mary Jones. Stephen was a Senior Security Analytics Team Engineer who joined Nuspire just over four years ago and obtained his CISSP while at Nuspire. He was instrumental in the development of Nuspire's internal policies, procedures, and security posture. Additionally, he worked with important clients and partners such as Steelcase and Collabrance to improve their cybersecurity posture. Those clients Steve worked with raved about his knowledge, advisement, problem-solving skills, and superior customer service. Steve was always willing to go the extra mile to ensure Nuspire and its clients had the information and cyber security protections needed. This included delivering assistance beyond the contracted work and providing assistance on many nights and weekends. Steve was the consummate team member and cybersecurity professional. List of professional certifications and titles include: CISSP - Certified Information Systems Security professional; CSP - Fortinet Certified Network Security Professional; FCNSA - Fortinet Certified Network Security Associate; CCDA - Cisco Certified Design Associate; and CCNA Security - Cisco Certified Network Associate Security. Funeral services will be held at E.C. Nurre Funeral Home 177 W. Main St. (St. Rt. 125), Amelia, on Saturday, April 13, 2019, from 2:00 PM until time of funeral service at 4:00 PM. In lieu of flowers, please consider making a contribution in Stephen’s name to the Tori Thomas Geology Scholarship, https://foundation.uc.edu/areas-donate?id=c9fa1e07-07d8-46e7-879c-3ff957504f5b or Cincinnati Children’s Hospital Medical Center, https://giving.cincinnatichildrens.org/SSLPage.aspx?&pid=184 , select “other” and type in “Dr. Pressey Sarcoma Research”. Please sign Stephen's online tribute wall at www.ecnurre.com. "Email Address" would like to share the life celebration of Stephen Andrew Caldwell. Click on the "link" to go to share a favorite memory or leave a condolence message for the family.